Dynastar Legend X106 Skis - Men's: Designed to take you anywhere, the all-new LEGEND X106 eliminates the boundary between ‘freeride' and ‘all-mountain' for truly inspiring all-terrain performance. Our newest Powerdrive Free construction unleashes smooth dynamic power, playful energy, and ground-breaking grip for the most responsive ski control. A progressive rocker profile and five-point sidecut supply the natural versatility and float to make the entire mountain your playground. 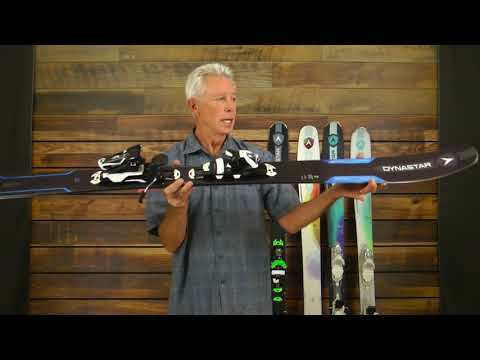 View our complete collections of Dynastar Skis in the Legend lineup. The key to the Legend X106’s unique snow feel is a feature Dynastar has dubbed Powerdrive. It consists of a 3-piece sidewall, which in the case of the Legend X series is made from vertical layers of TPU, Paulownia and ABS on the outside. Its principal purposes are to provide a dampening element and to liberate the laminates in the core from their bond with the outer sidewall. Free to shear in response to shocks delivered to the forebody, the ski is better able to stay on the snow. And the Legend X106 does it without using a drop of Titanal.